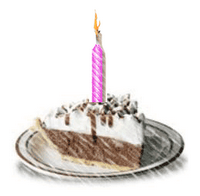 Golden State Woman: Eat Birthday Pie Every Chance You Get! Today is Andrea's 15th birthday. After our recent sad losses, it's a double-pleasure to celebrate such a joyous occasion. I treated her to lunch out at the local eatery of her choice, followed by a trip to the Jewelry Mart, where she selected a pretty bracelet as her birthday gift. Tonight, she continues in our church drama department's family-friendly production of Grease, and afterwards, we're hosting friends for a birthday dessert party at Marie Callendar's Pies. Andrea is a lovely and sweet young woman, and one of God's great blessings in our lives. While I never preach living just for today, recent losses of loved ones reminds me again that God never promises tomorrow to us. Eat birthday pie, and honor a loved one, every chance you get!